A four-day "Celebration of Cycling," the Subaru Sea Otter Classic powered by SRAM is regarded as the world&apos;s largest cycling festival. Part recreational biking, part competitive event, part festival, part expo and 100 percent fun, the Sea Otter Classic returns to Monterey, California from April 11-14, 2019. This action-packed cycling extravaganza features amateur and pro cycling events as well as family activities for all ages, attracting 71,000 fans from around the world. The Sea Otter Classic also plays host to one of the largest consumer bike expos in the world. Sea Otter&apos;s Gran Fondo on Saturday offers two fully supported road rides: a 49-mile Coastal route and a 91-mile Carmel Valley route. Also on Saturday, the mountain bike Gran Fondo will take riders on a 19 mile tour of the trails of the Fort Ord National Monument. Routes start and finish at Laguna Seca; all three end with a celebratory lunch. Sea Otter&apos;s Gran Fondo (Italian for "Great Endurance") is a ride, not a race, to be enjoyed with family and friends. It is open to all ages and capabilities, including children twelve and up when accompanied by parent or adult guardian. The Mountain Bike route goes across the Bureau of Land Management (BLM) trail system on Fort Ord Public Lands. 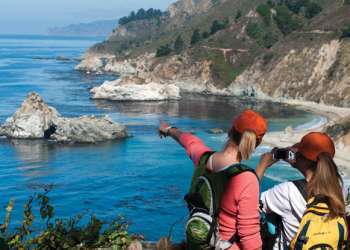 The Coastal route winds along peninsula communities, predominately on the stunning coastal trail, and passes through places such as Steinbeck&apos;s Cannery Row. The Carmel Valley route first runs through the agricultural fields of the sweeping Salinas Valley, the "Salad Bowl of the World," then Carmel Valley&apos;s wine country. The Gravel Grinder Tour is a 29-mile ride through the Fort Ord National Monument, the majority of which takes place on dirt and gravel roads. Riders will enjoy the low elevation of the flat and rolling roads on this scenic land. These events will sell out quickly, so make sure to pre-register! See the Sea Otter Classic website for more information. Sea Otter is for all ages, with special activities for kids, including races on a course designed to stretch skills and build confidence. The Bike Play Zone allows kids to try out budding skills on obstacles appropriate for their age and riding level. For the 21-and-up crowd, many will enjoy taking in the scene from the beer and barbecue garden. There&apos;s an all-ages international food court too, where you can kick back and relax with family and friends. See the Festival Guide at the Sea Otter Classic website for more information. Looking for a new bike or equipment? Check out the Sea Otter Classic Expo. More than 400 exhibitors will show off the latest in technology, nutrition, clothing, gear, literature, and mechanics to keep you on the cutting edge of cycling. This is the consumer&apos;s biggest and best bicycle event in North America. You&apos;ll have the hands-on opportunity to test out bicycle products from bike helmets that even cycling teenagers will find cool to the latest in suspension technology and carbon fiber craftsmanship. There&apos;s an event for every kind of competitive cyclist at the Sea Otter Classic. Professionals, amateurs, road and mountain cyclists will each find multiple events during the four days of racing — and spectators will find many thrilling activities to watch. Mountain bike races include downhill, cross-country, dual slalom and short track. Road cycling events include criterium, road and circuit races, plus a pro/elite stage race, most of which are held right on the famous WeatherTech Raceway Laguna Seca. Pre-registration is essential to participate in these events. See the Athlete Guide on the Sea Otter Classic website for more information. Sea Otter Classic admission is free all four days for children twelve and under and for registered athletes (competitive or recreational). See the Sea Otter Classic website for more detailed ticketing information. The Sea Otter Classic website has an online schedule, detailing every event, exhibit and demonstration throughout the four-day weekend. Come experience this annual "Celebration of Cycling," and be a part of the world cycling community that shares in this exciting springtime tradition.